Welcome to Three’s a Crowd Part Two, if you have not already read Three’s A Crowd – Part One please do so as I will be continuing on from where that article left off. Part One was very much about the theory behind Power chords whilst Part Two focuses much more on the playing side introducing new techniques that can be used to get the most from these chords. So with out further to-do lets get started. Palm muting is a common technique in all styles of guitar music and is performed by laying the side of the strumming hand across the strings just before they meet the bridge. It is important to ensure the palm of the hand is placed correctly, if the hand is too far back no muting will occur if the hand is too far forward too much muting will occur. Palm muting is shown in notation with the letters PM followed by a broken line, this line encases the notes that are to be palm muted. The exercise below uses a G5 chord, which is played with an eighth note strum pattern with all down strokes. Practise applying palm muting to the chord as described above. Palm muting is a very useful technique to add dynamics to a song, mixing palm muted and non-palm muted notes can also make the rhythm more interesting and help to drive the song along. Below is the Intro to “Glycerine” recorded by Bush and taken from their debut album Sixteen Stone. The song comprises of only four chords but uses a mixture of palm muted and non-palm muted notes to create a syncopated rhythm, this adds interest to the otherwise repetitive chord progression. 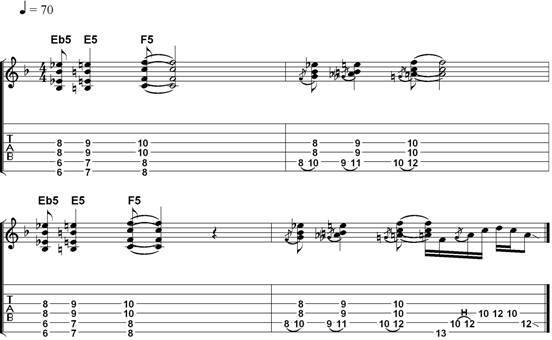 Below is a power chord riff taken from the intro to “For Whom the Bell Tolls” by Metellica and features on their second album 1984’s “Ride the Lightning”. 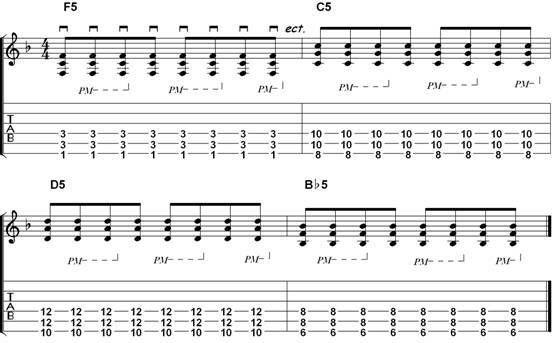 The riff employs chromatic descending power chords, which should all be played with down strokes and palm muting except for the last chord in bars two and four, which are non-palm muted and accented. The mixture of chromatic chords and palm muting creates a menacing riff, which is a major component of the metal genre. The riff is also a great power chord work out requiring both speed and accuracy so start off slowly making sure all of the notes are heard in each chord. A power chord contains two notes; the root and the fifth. In an “A” power chord played on the sixth string the root note is on the sixth string fifth fret and the fifth is on the fifth string seventh fret. 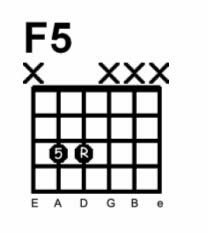 To make this chord in to an “A” diminished power chord simply flatten the fifth by playing the sixth fret on the “A” string. 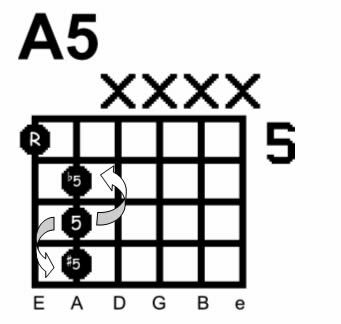 To make an augmented power chord raise the fifth by playing the eighth fret on the “A” string. 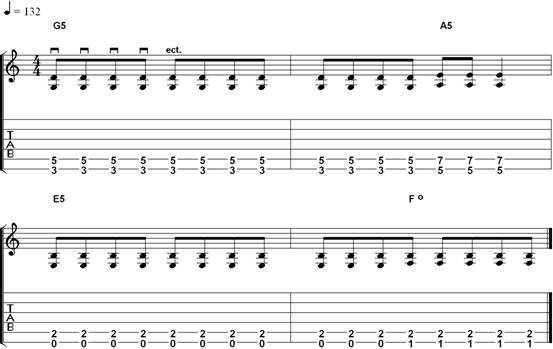 To illustrate the use of augmented power chords I have chosen the main riff from “Lose Yourself” by Eminem which consists of a simple two bar power chord riff starting out with a “D” power chord in the first bar moving to a “D” augmented power chord in the second. 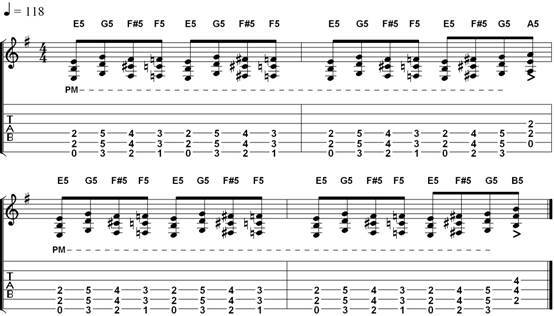 The riff should be played with down strokes (except the last note of bar two) and palm muted throughout. All of the chords should be played staccato. To play a chord staccato simply cut the chord short with a rest, this can be achieved by taking the pressure off of the chord. Beats two and four should be accented shown by a > under the note head. You will also need to barre both the sixth and fifth strings using your first finger throughout in preparation for the 10th fret double stop at the end of the second bar. To illustrate the use of diminished power chords I have chosen the verse from Since U Been Gone by Kelly Clarkson. The verse starts with a G5 chord that lasts for one and a half bars, on the third beat in the second bar the A5 chord is introduced with the rhythm changing slightly on the fourth beat from two eighth notes to a quarter note. When playing the E5 in bar three remain in the power chord shape by using your third finger on the second fret of the “A” string, when it comes to the “F” diminished power chord in the final bar use your second finger on the first fret of the bottom “E” string. The most famous riff of all time Smoke on the Water by Deep Purple utilizes inverted power chords. Use one finger to barre both notes as appose to two as this will make changes quicker and easier. Watch out for the rests making sure you completely kill the sound. Ritchie Blackmore played the riff with his thumb and first finger while Steve Morse used a pick to give the riff a tougher sound, so perhaps experiment and find what works for you. To give inverted power chords a fuller sound you can add the octave of both the root and the fifth. This is demonstrated in the intro to The Wind Cries Mary by Jimi Hendrix. To play the power chords use your first finger to bar the “E” and “A” strings and your third finger to bar the “D” and “G” strings. In the second bar use your first finger to bar the eighth fret and hammer on with you third finger. I hope this article has been of interest. If you are interested in rhythm guitar and power chords and would like to study the subject further the Troy Stetina Metal Rhythm Guitar series is a good place to start.